Several people have commented that corporations and other organizations would prefer to have a "curriculum" or syllabus of materials to be shipped in upcoming subscriptions. In this way, they can know and approve in advance what they are investing in for the training of their people. This is a reasonable request, and one we've taken seriously. For that reason, we have assembled just such a curriculum within the LLR series and will be offering a flyer for sale, as well as questions and answers employers etc. can use to make sure their people are going through and comprehending the material. I have included the promotional flyers and curriculum summary here attached to this post. You can, of course, print them off for free if they will help you make such a sale. Deal directly with our office in terms of billing and supply, of course, as this is a little bit outside our normal process. But stay tuned for hard copy versions of this for sale soon! Awesome tools Chris! Thanks for getting these together. Are these available/for sale in high gloss print yet? I don't see them in the cart, unless I am looking in the wrong place. Got an ETA for them? They look great!!! When will the questions/answers to check whether employees went through and comprehend the material be available? Also, do we just contact lifesupport if we have a corporation that wants to get started on this? This is pretty awesome Chris! I have been bugging my upline and Wayne about this program for some time now. We already have a few organizations that we gave a heads up to about this coming so Im excited to follow up and get them started! I noticed it said on one of the promo sheets about a test for the employees as a method of accountability, which is pretty cool. Is there going to be a rough outline of how they could go over the matetials as a group or would that be left up to the employer/us to figure out for each individual case? Additionally, is there going to be a separate enrolment sheet or link on the site for corporate customers or do we place these through life support? Thanks Chris, you guys are doing awesome! Every time i come on here i get more excited about LIFE! Chris, this is absolutely FANTASTIC! Great job on the content selection, and as always, the graphic designers have done a solid job with the look of the flyers. Kudos to everyone involved in putting this together! Chris: Wow, this is awsome. First person I showed them to, said, I need to get these to my company!! Many thanks for being ahead of the curve. Stuart. WOW! Love this idea, and especially love that we can give the companies a clear and concise curriculum! Great Idea's and implementation! Great job Chris!! I've been hoping Life would do something like this for some time. Do you think that there might be a workbook to go along with the course in the future? I have spoken with some HR managers that I work with and they like what we have to offer, they also like the monthly tests that show accountability/ task completion. Keep up the great work, I am looking forward to see what Life does in peoples lives in the future. Fired Up! Ask and we shall receive! WOW! Thank you for all of the hard work you are doing to make LIFE even better! They will be for sale on the Shopping Center within a week or so, in high gloss, full quality. I just wanted to put them up here for everyone to see, and in case someone really needed them to make a sale and could print off a high quality rendition for that purpose. Yes! There is not a workbook, per se, other than the complete LLR Workbook, of course, but for these specific 6 months worth of CDs, there are questions (and answers) provided on PDF downloads that you will be able to access for free. These will be available at or before the time the glossy brochures I've attached below go for sale on the Shopping Center. Someday in the future, too, we will likely have an online environment where customers can go to answer questions and receive certificates for their completion of going through these CDs and books. I already have a number of business owners I want to approach with this program. What a fantastic addition to an already awesome line of products. I do have a couple of questions: Is there a webpage we can direct potential employer-customers to where they can see the information that is on the flyers, and maybe test run the quizzes their employees would be taking? Almost invariably, prospects ask for a website they can check out for themselves. Also, is the wording on the Corporate Flyer set in stone? I'd like to use it right away but the choice of words in the bit about "emotional two year-olds" and "losing the high school mentality" strikes me as being a bit on the negative and abrasive end. I have no doubt that most companies deal with people with low emotional IQs that have yet to outgrow a high school mentality, but perhaps there's a different way to say it that doesn't run the risk of offending employers (they hired the two year-olds) and employees (they're being called two year-olds). This second question takes nothing away from the gratitude I feel for being part of a company that works tirelessly to offer its business partners the best opportunity to live the life we've all dreamed of. Thank you for all you do! 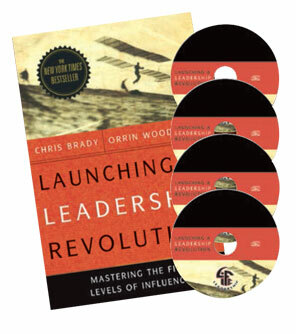 Are all of the audios in the Leadership Curriculum available as singles to purchase to give as samples?? I showed this to a client of mine and sold them on the spot! What a great tool!!! Just one question, now that I have sold this program to my client, how do I set them up? Wow, Chris!! This is fantastic. Just what I've been looking for to take to several companies in the area along with the one I am a manager with. Thanks for putting this together. Anxious for the brochures that look professional instead of my printer! There will be a website where the questions and answers to the questions are housed, but not yet. Also, that flyer was originally created to be a bit whimsical in its approach, to stand out from the boring daily corporate stuff most of these buyers face. The other one is geared toward being more professional. As we are only just now launching this initiative and really I am letting these flyers out ahead of time, I will ask that everyone be patient as we build up the support structure to round this out. The audios listed in the curriculum are renamed with generalized titles. They were all produced previously under other titles. But no, these newly titled ones are not available as singles. Instead, the LLR Sample pack entitled "Leading Your Way to a Better Life" is the pack to be used for sample purposes. These are amazing. I got involved with LIFE when I was a corporate director and responsible for company training. I felt that LIFE offered the best value for my budget. The new promotional items are fantastic. This could be the single greatest development for customers that LIFE has launched yet. Kudos on getting this rolled out. I can't wait to arm myself for the melancholies out there that need every detail before jumping on board. Chris, very excited about this product. I can start one company branch as soon as the program is ready, with 32 additional branches nationwide (about 300 employees total) as soon as the first branch completes the course and the results have been reviewed by corporate management. Fired Up!!! Awesome Chris!!! I can't wait to introduce this to the company I work for, my supervisor has already inquired about the information I have been listening to and reading. I was seeking some information from my fabulous upline, Kevin Swedberg, and he directed me to this forum (It is nice to be taught to fish instead of just being fed the fish). This is great and I know it will help. Thank you Chris for your forward thinking and your willing and listening heart. It is exciting to work with an amazing group of professionals. Does the corporate program follow the 3 for free as well? So if they get it for 4 employees then 1 of those would be free or would they still pay for all 4? It depends upon how you set it up. If you are having them order by paying with a credit card through the website (and of course, using your LIFE Member #), and you type them in correctly, meaning, put the order correctly showing one referring three others, etc., then yes, the 3 for FREE applies. However, if you contact the office and have them bill the corporation directly in a bulk order situation (this is a privilege reserved only for those larger types of orders with companies that aren't used to paying with a credit card) then no, there is no way to work out the 3 for Free. However, remember that in any situation, you are the person in charge of the sale, and our prices are only suggested retail prices. If you were to buy in bulk and supply/deliver them to your customer yourself, you could offer whatever discount you wanted to (taken out of your 25% retail bonus and the further money you'll make on the volume from the Performance Bonus Chart) to land the sale. This, in fact, is good practice, as one of the best ways to continue ongoing customer satisfaction is to arrange ways in which you can maintain frequent contact with the customer. By taking their subscriptions to them, it builds this in automatically. So as you can see, there are many ways to do this. I hope this answer was helpful! Awesome answer. I appreciate your perspective on it on how it could be setup and to maintain contact with them. Great clarification Chris, thanks so much for all your efforts and keeping tuned to this forum, love the up to date and super fast response time in all these matters. Keep on keeping on! Awesome. Another great tool that we have for corporate customers thanks to Chris Brady and everyone at the LIFE office. Any updates on when we can start getting customers hooked up on this? Chris, when will this product be available? I have several companies interested. I have approached banks, doctor's offices, retail stores, business offices, about this. I'll be excited to see how this product develops!! Has anyone heard of any updates getting this off the ground? I'm a little anxious if some of these businessnes start to really want this can I deliver the product. Is there anything (besides the LLR subscription) that we can offer in the interim? Ideas? Fired up!!!!!!!!!!!!!!!!! Due to the many posts we are getting asking about an update on the rollout, we will leave the previous posts there for that question, but will refrain from approving more for the time being to keep the thread clean (would you really want to have to scroll though many posts asking the question before you can get to the answer? Okay everyone, here's the scoop. The program is already up on the website and fully functional. Go to the page listing the various product subscriptions that are available, and scroll down and select the "LLR Corporate" option. The flyers, which got lost in transit to the Chart Toppers weekend, will be up on the Shopping Center and available at the end of the week. Holy cow! Now this is awesome! LLR CORPORATE EDUCATION SYSTEM The 6-Month Leadership Development Program Designed to Transform the Corporate World! LIFE Leadership Members, now it’s even easier to make corporate sales of our popular LLR subscription materials by letting clients know in advance the content that will be provided. For this purpose, we have specially prepared a six-month curriculum featuring some of our most effective LLR products designed to help companies bring out the existing but unseen leadership potential in their workforce. For only $50 per employee per month, the six monthly packages of 1 leadership book and 4 audios each provide just the right amount of new information and principles every month over an extended period of time in order to foster lasting change in employees and systemically transform the workplace environment into a culture of leadership. We also created optional tests that are available at no additional charge so employers can monitor the progress of individuals while encouraging employee participation and group discussion. These tests can be found under “My Forms,” so you can forward them to your customers as needed. And once your corporate clients have experienced firsthand the dramatic impact this course has on their organization, be sure to let them know that our ongoing LLR Series subscription is the perfect tool to help them maintain their new leadership culture and continue seeing even more enhancements over the long term. To help you market this powerful new program and grow your business, we have produced two flyers and bundled them into a convenient LLR Corporate Education Flyer Pack. The pack contains 15 copies each of the LLR Corporate Education Curriculum Flyer that details the course materials for each of the six months and the compelling LLR Corporate Education Sales Aid Flyer designed to capture the attention of business professionals and help you promote the product with ease. Click here to purchase. When enrolling your corporate customers, simply select the “Corporate Customer” check box and the “LLR Corporate Education System Subscription” option will appear, in addition to all of the other standard options, on the “Books and CDs” subscriptions page. As always, whether it’s for a small customer base or a larger group, we’re here to help with any special billing needs or logistics. Contact Corporate Services atcorpsupport@lifeleadership.com with any questions or comments. Hi Chris, this is awesome! 1- Are they locked in for 6 months or is it similar to a regular subscription that could be cancelled at anytime? 2- Does the 30 day guarantee still apply to this product as well? Thanks, keep up the fantastic work! The 6 months of information is only presented this way because, as we approached companies about buying our stuff, we learned that they wanted to know in advance what they were signing up for. What resulted from that is this 6 month syllabus. It doesn't mean the corporate customer is locked in to buying all six months, it simply is there to inform them of what is coming. However, some people have made the sale to corporate customers by getting them to buy it in one chunk, all up-front. In this case, they would be subscribing, obviously, to the whole six months. And yes, the 30 day money-back guarantee applies to all products we sell, no matter who the customer. Good luck everyone! Let's make this corporate initiative one of our top sellers!! This is exactly the product I need for the customer I am working with. I am looking forward to sharing the information with them now that it is laid out in such professional and concise brochure. I am pleased to announce Ferris State University as a new customer. Launching a Leadership Revolution subscription was instumental in helping us set up their program. As with any business, or corporation, employee retention and training is paramount to success. That is also true for the acedemic world. Keeping employees engaged and motivated at our acedemic institutions can only transfer into better learning opportunity and success for students . In a world where their future is uncertain at best, our college graduates will need every advantage they can get. The information their administrators, professors and university staff use to help grow in their leadership will transfer to the students, helping them start their chosen careers on a positive note. I am proud to be a part of this process, as the LIFE business has improved my personal life and now I get the opportunity to help pay it forward to our youth. Chris and his team nice job getting this out. You folks ROCK. Happy Selling! Wow! What a great product, well worth the wait!! Thanks Chris you and your team have done an amazing job. I will be signing up my first customer on the 1st. We are doing a test bed with 7 employees at their small location here in Memphis, TN and then if does as we predict, as we know it will, they will move it into their other 32 locations, starting with their corporate office in Moline, IL with 147 employees. This is Awesome!! What a great way to systematically involve companies that want to improve their performance and develop their leaders.